Media and Arts graduate Isobel Phoebe Montgomery has been awarded the prestigious Rhodes Scholarship. With an outstanding academic record at the University of Adelaide, Isobel Phoebe has received one of only three Australia-at-Large Rhodes Scholarships offered each year to study at Oxford University. She will travel to University of Oxford next year and read an MPhil in Evidence-Based Social Intervention and Policy Evaluation at Oxford University with the hope of researching the current effectiveness of current domestic and family violence approaches in SA, to ultimately inform policy that supports early intervention, and lead to sustained action against gender-based violence in Australia. As a child, Isobel Phoebe witnessed domestic and family violence and has also experienced poverty. 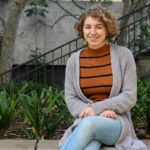 Isobel Phoebe will graduate with a Bachelor of Arts (Honours) with a major in history and is on track for a First-Class following her Bachelor of Media and a Bachelor of Arts (History & English) at the University of Adelaide. 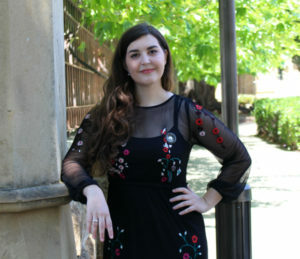 She has an outstanding academic record and is the recipient of many awards and programs, including the Frederic S. Zuckerman Prize for Best Essay in Russian History, selected for an overseas placement program for Japanese Media Studies at Ritsumeikan University and attended summer school at the University of Cambridge, receiving a High Distinction for her final essay on Vichy France. She has also completed an Arts Internship at the Women’s Safety Services SA (WSSSA), where she produced a report which delved into effective social media use by domestic violence organisations. Isobel Phoebe joined the WSSSA staff and was promoted to Assistant to the Director of Services and now continues to work at WSSSA in the domestic violence sector in which she manages committees, including the Women’s Safety Services SA NAIDOC Week and International Women’s Day committees. On top of this, she runs successful social media campaigns for the annual South Australia domestic violence vigil and the United Nation’s 16 Days of Advocacy. Isobel Phoebe has a strong interest in contemporary history and the lingering impact of historical trauma and is passionate about domestic violence advocacy and addressing the epidemic of domestic and family violence. She has also volunteered at community radio station Radio Adelaide, as a social media manager, radio presenter and music journalist, which gives her a platform for her advocacy work. She is the uni’s 111th Rhodes Scholar in the 110 years the scholarship has been awarded in Australia. The Rhodes Scholarship perpetuates the commitment to learning, research and humanity of businessman and philanthropist Cecil Rhodes, who died in 1902, leaving his estate to fund the Scholarship. Candidates are selected on the basis of outstanding intellect, character, leadership, and commitment to service. The Rhodes Scholarships support students who demonstrate strong propensity to emerge as ‘leaders for the world’s future’. 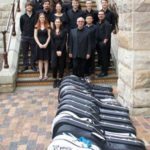 Classical guitar students from the University of Adelaide’s Elder Conservatorium of Music will embark on a six-hour performance marathon. Following up on the success of last year’s inaugural event the Guitarathon will kick off at 12.00 pm, Sunday 4 November in Elder Hall. Meet Isabella Flachsenberger. Isabella undertook the 2017-2018 Adelaide Summer Research Scheme (ASRS). We sat down with Isabella to learn all about her experience and her research into The Use of Virtual Reality in Education. Emma Carson undertook the 2017-2018 Adelaide Summer Research Scheme (ASRS). We sat down with Emma to learn why she applied for the scholarships and what opportunities have arisen from her project; Revisiting the Tate Museum: History of Science in Action.